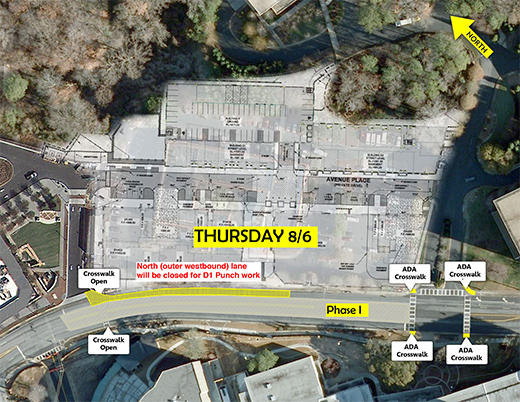 Construction on Clifton Road will require lane closures Aug. 6-8 and Aug. 15. One lane of traffic in each direction will be maintained throughout the project to minimize traffic congestion. Roadwork will generally take place from 9 a.m. to 3 p.m.
Thursday, Aug. 6, 9 a.m. – 3 p.m.
Friday, Aug. 7, 9 a.m. – 3 p.m.
Saturday, Aug. 8, 9 a.m. – 3 p.m. This will include the east ADA ramps. Pedestrian traffic will be maintained at the west crosswalk of Conference Center Drive. Saturday, Aug. 15, 9 a.m. – 3 p.m. This will include the southwest ADA ramp. Pedestrian traffic will be maintained at the east crosswalk of Conference Center Drive. Construction planners note that when both the north and south outer lanes are closed, the inner lanes will be open to maintain traffic flow. An accessible route will also be maintained during work on ADA ramps.